>This cheque paying function is a distinguished one of a banker. >This obligation has been imposed on him by sec.31of the NI. Act, 1881. >A banker is bound to honour his customer’s cheque, to the extent of the funds available and the existence of no legal bar to payment. >Again, for making payment the cheque must be in order and it must be duly presented for payment at the branch where the account is kept. >The paying banker should use reasonable care and diligence in paying a cheque, so as to, abstain from any action likely to damage his customer’s credit. >lf the paying banker wrongfully dishonors a cheque, he will be asked to pay heavy damages. >At the same time, if he makes payment in a hurry, even when there is no sufficient balance, the banker will not be allowed to debit the customer’s account. If he does so, it will amount to sanctioning of verdraft without prior arrangement, and, later on, the customer can claim it as precedent and compel the banker to pay cheques in the absence of sufficient balance. His position is very precarious and is in between the devil and the deep sea. Presentation of the cheque . (a) Type of the cheque: Before honoring a cheque , he must find out the type to which It belongs. Cheques may generally be of two types- open or crossed.If it is an open one, the payment may be made at the counter. If it is crossed, the payment must be made only to fellow banker. If it is specially crossed, the payment must be specifically made to that banker, in whose favour it has been crossed. If there are ‘ A/C Payee’ and ‘Not Negotiable’ crossings the paying banker need not worry , as they are the directions only to the collecting banker. 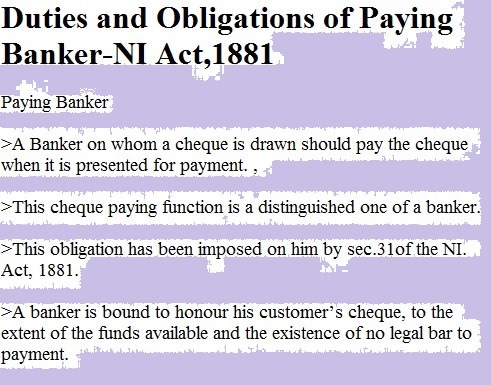 If the paying banker pays a cheque contrary to the crossing, he is liable to the drawer and to the true owner and this payment cannot be regarded as a payment in due course. Therefore, he must pay special attention to the type of a cheque. (b) Branch: The Paying banker should see whether the cheque is drawn on the branch where the account is kept. If it is drawn on another branch, without any prior arrangement, the banker can safely return the cheque. (c)Account: Even in the same branch, a customer might have opened two or more accounts. For each account, a separate cheque book would have been issued. Hence, the paying banker should see that the cheque of one account is not used for withdrawing money from another account. (d) Banking hours: The paying banker should also note whether the cheque is presented during the banking hours on a business day. Payment outside the banking hours does not amount to payment in due course. The hours, of banking business are statutorily laid down. (e) MutilatIon: If the cheque is torn into pieces or cancelled or mutilated, then, the paying banker should not honour it. He should return the cheque for the drawer’s confirmation. In a case cheque is torn accidentally, the drawer must confirm it by writing such words as ‘Accidentally torn by me’ and affixing his full signature. A cheque torn into two or more pieces is generally returned with a remark Mutilated’. (a) Printed form: The cheque must be in proper form, It must satisfy all the requirements of law. The customers should draw cheques only on the printed leaves supplied by the bankers. (b) Unconditional order: The cheque should not contain any condition. If it is a conditional one , the paying banker’s position will become critical and he may not honor it. (c) Date: Before honoring a cheque, the bank must see whether there is a date on the instrument. If it is undated, it cannot be regarded as a valid instrument. If a cheque is ante- dated, it may be paid ¡f it has not become stale by that time. A cheque which is presented after six months, from the date of its issue is a stale one. If a cheque is post- dated, he should honour it only on its due date. (d) Amount: The next important precaution is that the banker should see whether the amount stated In the cheque, both in words and figures, agree with each other. If the amount is stated only in figures, the banker should return it with a remark ‘Amount required to be stated in words’. However if the amount stated only in words, the banker may honor it as per Sec.18 of the NI. Act. According to Sec, 18 of the NI. Act, if the amount undertaken or ordered to be paid is stated differently in figures and words, the amount stated in words shall be the amount undertaken or ordered to be paid. But, usually the paying banker returns the cheque under such circumstances, since, there is an audit objection to the practice of honouring such cheques. If the alteration is confirmed by the drawer by means of his full signature, then the banker can have no objection to honor it. If the alteration is not apparent, and, if it is paid in due course, then, the banker will not be liable. There must be sufficient balance to meet the cheque. If the funds available are not sufficient to honor a cheque, the paying banker is justified in returning it. So, before honoring a cheque , he must check up the present state of his customers account. The next important duty of a paying banker is to compare the signature of his customer found on the cheque with that of his specimen signature. If he fails to do so and if he pays a cheque , which contains a forged signature of the drawer, then, the payment will not amount to payment in due course, Hence, he can not claim protection under Sec. 85 of the N.I.Act. Before honoring a cheque, the banker must verify the regularity of endorsement, if any, that appears on the instrument. It is more so in the case of an order cheque, which requires an endorsement before its delivery. For instance, if there is per pro endorsement, the banker must find out the existence of authority. Failure to do so constitutes negligence on the part of the paying banker. The existence of legal bar like Garnishee Order limits the duty of the banker to pay a cheque. .
VII. Circumstances under which a cheque can be dishonored. Countermanding: Countermanding is the instruction given by the customer of a bank requesting the bank not to honor a particular cheque issued by him. When such an order is received, the banker must refuse to pay the cheque. Countermanding, in order to be really effective, must be in writing. The written mandate should contain all the details of the cheque, viz:, date, number of the cheque, name of the payee and the amount . The mandate must be signed by the customer. (b) Upon the receipt of notice of death of a customer: When a banker receives written information from an authoritative source, (preferably from the nearest relatives) regarding the death of a particular customer, he should not honor any cheque drawn by that deceased customer. If the banker is unaware of the death of a customer, he may honor the cheque drawn by him. Death puts an automatic end to the contractual relationship between a banker and his customer. .
(d) Upon the receipt of notice of insanity: Where a banker receives notice of a customer’s insanity, he s justified in refusing payment of the cheque drawn by him. The banker should make a careful note, when the lunaçy order is received. It is advisable that the banker should act upon a definite proof of the customer’s insanity like a doctor’s certificate, a court order etc. (e) Upon the receipt of notice of assignment: The bank balance of a customer constitutes an asset and it can be assigned to any person by giving a letter of assignment to the banker. Once an assignment has been made, the assignor has no legal rights over the bank balance and therefore, if any cheque is drawn by him, the banker should refuse to honour it. (f) When a breach of trust Is intended: In the case of a trust account, mere knowledge of the customer’s intention to use the trust funds for his personal use, is a sufficient reason to dishonour his cheque. (g) Defective title: If a person who brings a cheque for payment has no title or his title is defective, the banker should refuse to honour the cheque presented by him. For instance, a person who brings a cheque, which has been countermanded or which has been forged, has no title to it. (a) NS., NF., N.S.F. : These abbreviations denote the absence of sufficient money in the account of the customer. N.S means Not Sufficient, NF means 40 funds, N.S.F. means not Sufficient Funds. (c) E.N.C. It refers to Effects Not Cleared.’ This answer is used when cheques are drawn against cheques paid ¡n but not yet collected. (f) Exceeds Arrangement’: It ¡s used when the cash credit or 0.D. is completely exhausted. (g) DR. It ¡s an abbreviation of ‘Discharge Required.’ It is used when the instrument is not discharged with proper endorsement. (I) RD. : It means ‘Refer to Drawer’. Now R.D is most commonly used by bankers, It is a mild form of refusal. It is generally meant to convey to the holder the idea that the cheque has been dishonored and he Should find out the reason for it from the drawer. Supposing, a paying banker pays a cheque which bears a forged signature of the payee or endorsee, he is liable to the true owner of the cheque. But, it is quite unjustifiable to make the banker responsible for such errors. It is so because, he is not expected to know the signature of the payee or the endorsee. He should have paid an order cheque. Such a cheque should have been endorsed by the payee or his order. It should have been paid in due course. (I) Apparent tenor of the instrument: To avail of the statutory protection, the payment should have been made according to the apparent tenor of the instrument. The apparent tenor refers to the intention of the parties as it is evident from the face of the instrument. Example: If a drawer draws a cheque with a post —date, his intention is to make payment only after a certain date. If it is paid before the due date, this payment does not amount to payment in due course. So also, the payment of a countermanded cheque does not amount to payment in due course. (ii) Payment in good faith and without negligence: Good faith forms the basis of all banking transactions. As regards negligence, the banker may sometimes be careless in his duties which constitutes an act of negligence. If negligence is proved, the banker will loss the statutory protection given under Sec. 85. (a) Payment of a crossed cheque over the counter. .
(c) Failure to verify the regularity of an endorsement. (iii) Payment to a person who is entitled to receive payment: The banker must see that the person, who presents the cheque, is in possession of the instrument and he is entitled to receive the amount of the cheque. Protection to a bearer cheque: Now this protection has .been extended to bearer cheques also under sec. 85(2). If a bearer cheque is paid in due course, the banker is entitled to get protection. (3) The banker has made the payment in due course. (I) Money received mala fide is recoverable: When a person receives money by mistake in bad faith, knowing that he is not entitled to receive that money then the banker is entitled to recover the same. (ii) Money paid under a mistake of fact is recoverable: For instance, a banker pays money to X, thinking that he is Y. This is a mistake of fact regarding the identity of the parties. Y is under a legal duty to pay the money back to the banker. (a) If he allows his customers to withdraw money before cheques paid In for collection are actually collected and credited. (c) If there is a reduction in the overdraft account of the customer before the cheque is collected and credited in the respective account. In all these cases, the banker acquires a personal interest. A Banker as an agent: In practice, no banker credits a customer account even before a cheque is collected. He collects a cheque on behalf of a customer. So, he cannot acquire any of the rights of a holder for value, He has to act only as an agent of the customer.